Home → Solutions → Is your website achieving its goal ? Is your website achieving its goal ? 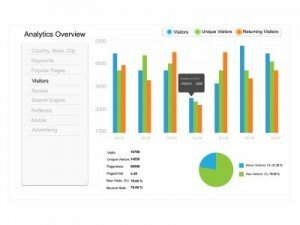 Website analytics enable you to monitor more than just page views. You can track those pages that attract most visitors, referral sources, devices used by your visitors, etc. We implement the Google and Bing Analytics tracking code for all websites we design and we show you how to monitor traffic. ability to convert a visit into an action (subscribing, filling a form, buying,etc. ); this is called the conversion rate. This information is essential for the fine tuning of your website. It lets you check the popularity of new articles or updates, and verify that your website fulfils your business goals. It is also vital information to plan successful pay-per-click AdWords campaigns. We provide full website analytics services or we also train you to extract and interpret data provided by Google Analytics and Bing Analytics.